Description: "This book is intended as a guide for the amateur gardener when choosing flowering shrubs from the bewildering number of varieties offered by nurserymen for cultivation in this country. Peter Hunt has made a representative selection of a hundred species, each of which is fully described with notes on the most suitable soil and climate, pruning, propagation, etc. 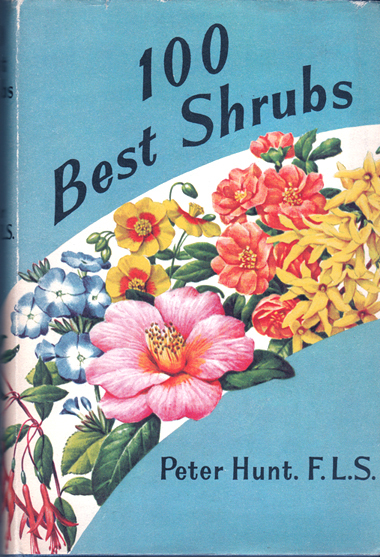 The book also contains an introduction to the buying and cultivation of shrubs in general." Each shrub is accompanied by an excellent, full-page b&w drawing. Ultramarine cloth boards with black text on spine. Corners bumped; spine is straight. Unclipped (21s. 0d.) jacket has some minor nicks and rubbing along its extremities, but remains complete and is in excellent overall condition. Pages have a light vintage tan, but are in superb condition: crisp, unmarked, tightly bound, and with not a single speck of foxing to speak of. A lovely copy of a scarce title. Measures 19 cm × 12.5 cm (7.6″ × 5″). Oversize 12mo. 221 pp.